Elena Gritzan is an intern at Now magazine in Toronto. Steve Ward Graffiti throw being removed, or buffed. Steve Ward has walked these alleyways dozens of times, but he’s never seen that door open before. On this January morning, he can’t resist. He slips through and surveys the small space. There’s a rust-covered ladder leading to the roof, and he can reach it if he stretches his arms high enough. But first he turns around to shut the door. It could get awkward if someone on an afternoon stroll notices a six-foot-two stranger clambering up the ladder. 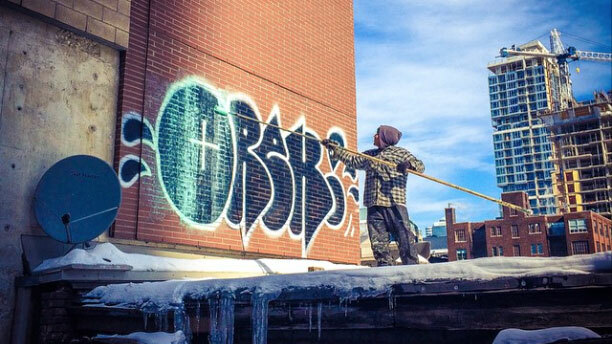 Ward is drawn to rooftops because he can always find graffiti there. He especially loves rooftops, like this one, that are normally inaccessible. Anything he finds has probably never been photographed before, so he will have something new for his 6,000-plus Instagram followers. He uses the brick wall as leverage, kicking against it to grab onto a rung with his left hand. Too late, he realizes that the ladder is extendable. His weight pulls it down, and the ladder’s extension smacks down onto the back of Ward’s hand, pinning it between the rungs. He’s stuck, feet barely touching the ground. No one knows he is there, and, since he closed the door, no one will find him. Eventually, he pulls himself out of the ladder’s grip. He’s stunned. He flexes his left hand, checking to make sure it can move. Confident it’s not broken, he climbs up the ladder. There’s no graffiti in sight. Only then does Ward seek out first aid, from his fiancée, Ellen Hurley, who works ten minutes away. By the time he gets there, his left hand has gone from indented to swollen. The next day, he goes to a walk-in clinic and stays home from work for three days after that. But he doesn’t stop shooting graffiti. After seeing the doctor in the morning, he’s out walking and taking photos by 11:30, and he keeps going for five more hours. Ward has been documenting Toronto’s illegal graffiti culture for the past two years on his Instagram account, creating a curated photographic archive on his almost daily walks through downtown. His dedication and knowledge have attracted the attention and respect of the city’s graffiti artists, who often introduce themselves to Ward at his day job at Sanagan’s Meat Locker in Kensington Market. Graffiti has its own language. Those who do it are writers, not artists—unless you’re a toy, a poor painter who doesn’t understand the community’s etiquette. Those who are the absolute best are kings. Beyond the vocabulary, graffiti has a visual language that remains a mystery to many people who see it every day. If you know what you’re looking for, you can see who the most revered writers are, which writers are friends, which have had a falling out. Since he speaks the language, Ward has a rare window into a hidden world. Ward’s role has changed since former mayor Rob Ford’s public crackdown on graffiti, which included a $400,000 contract for removal service Goodbye Graffiti. Now, a lot of graffiti is cleaned off quickly. Ward moves fast, climbing fences and entering abandoned buildings, to capture each new tag before it disappears. Today, documenters are more important than ever, making sure that the work of Toronto’s writers will still be seen and admired, even after the power washer strikes. Ward didn’t start noticing graffiti until he was thirty years old and between jobs. He spent hours walking around the city. “I just creatively needed something really badly,” he says. At first, stickers and textures grabbed his attention. He took photos of whatever street art he saw and threw them up on Instagram. He started to check up on a particular wall in the alley near his house, watching new tags appear every few days. At first, he couldn’t read anything. But as he did more research—obsessively combing through Instagram to learn how to read the names on the walls—he started to respect the craftsmanship. He learned to admire writers, rather than street artists who pasted up premade stickers, because they could work by hand and took chances. By the summer of 2013, he was hooked. As he learned more about graffiti, he started to see similarities to his other favourite form, jazz. “People think of both of these art forms as being very free,” he says. “But both have strict rules.” In both cases, the artist needs to learn the history—to be able to appreciate and understand the work of pioneers like Miles Davis or long-time Toronto writer Ren—and learn the basic techniques before improvising and finding a unique style. Some writers, though, are hesitant to have their work posted on public Instagram accounts like Ward’s. “What happens if I post it and all the kids go in there and toy it up? ” he asks. The biggest concern for writers, says Ward, is that someone inexperienced could figure out where the spot is, get caught trespassing, and cause it to be boarded it up. For that reason, Ward sometimes removes photos at the request of writers. Ward is relatively new at the game, but he has a more experienced counterpart in Patrick Cummins, who has been snapping photos of graffiti since 1999. Cummins is quieter and more composed than Ward, who swears liberally and laughs loudly. Yet the two are similar: both tall, both wiry from long-distance walking. They speak in rapid-fire graffiti terms, like a secret code, and talk about writers as if they are mutual friends. Ward talks about graffiti endlessly—“like, all the time,” says Hurley—and spends a lot of his time at home editing photos or checking Instagram. He goes out to shoot every day. He wakes up two hours before his shift at Sanagan’s, orders a double espresso at Manic Coffee, and starts to walk. He continues to comb streets and alleys on his lunch break, and again after work in the warmer months, when the sunlight lasts longer. Every day off, he goes on longer walks, sometimes venturing out to different parts of the city. These trips last upwards of seven hours, but he shows few signs of fatigue. Instead, he smiles. Sometimes, like this particular day in February, these walks end at the alleyway by his house, where he can check up on the wall where he first noticed the dynamic nature of graffiti. He had said, the night before, that no one would ever paint over the top layer, a hollow-lettered throw from 2012. But as he trudges through the alley, shoes wet with snow, he starts to laugh. “Hilarious!” he says. “And it continues.” The wall is covered with new black letters. The previous tags are barely visible.